This article is about the historical German colony. For the modern nation, see Cameroon. For the territories ceded to Germany by France in 1911, see Neukamerun. Historical German territory projected onto modern-day globe. Green: Territory comprising German colony of Kamerun. Dark grey: Other German territories. German Cameroon (German: Kamerun) was an African colony of the German Empire from 1884 to 1916 in the region of today's Republic of Cameroon. German Cameroon also included northern parts of Gabon and the Congo with western parts of the Central African Republic, southwestern parts of Chad and far eastern parts of Nigeria. The first German trading post in the Duala area (present-day Douala) on the Kamerun River delta (present-day Wouri River delta) was established in 1868 by the Hamburg trading company C. Woermann [de]. The firm's agent in Gabon, Johannes Thormählen, expanded activities to the Kamerun River delta. In 1874, together with the Woermann agent in Liberia, Wilhelm Jantzen, the two merchants founded their own company, Jantzen & Thormählen there. Both of these West Africa houses expanded into shipping with their own sailing ships and steamers and inaugurated scheduled passenger and freight service between Hamburg, Germany and Duala. These companies and others obtained extensive acreage from local chiefs and began systematic plantation operations, including bananas. By 1884, Adolph Woermann, representing all West African companies as their spokesman, petitioned the imperial foreign office for "protection" by the German Empire. Bismarck, the Imperial Chancellor, sought to utilize the traders on site in governing the region via "chartered companies". However, in response to Bismarck's proposal, the companies withdrew their petition. At the core of the commercial interests was pursuit of profitable trading activities under the protection of the Reich, but these entities were determined to stay away from political engagements. Eventually, Bismarck yielded to the Woermann position and instructed the admiralty to dispatch a gunboat. As a show of German interest, the small gunboat SMS Möwe arrived in West Africa. Germany was particularly interested in Cameroon's agricultural potential and it was entrusted to large firms to exploit and export it. Chancellor Bismarck defined the order of priorities as follows: "first the merchant, then the soldier". It was under the influence of businessman Adolph Woermann, whose company set up a trading house in Douala, that Bismarck, initially skeptical about the interest of the colonial project, was convinced. Large German trading companies (Woermann, Jantzen und Thoermalen) and concession companies (Sudkamerun Gesellschaft, Nord-West Kamerun Gesellschaft) established themselves massively in the colony. Letting the big companies impose their order, the administration simply supported them, protected them and eliminated indigenous rebellions. Germany was planning to build a great African empire, which would connect Kamerun through the Congo to its East African possessions. The German Foreign Minister said shortly before the First World War that the Belgian Congo was too large a colony for a country too small. The protectorate of Kamerun was established during the period generally known as Europe's imperialist "Scramble for Africa". The German explorer, medical doctor, imperial consul and commissioner for West Africa, Gustav Nachtigal, was the driving force toward the colony's establishment. By then well over a dozen German companies, based in Hamburg and Bremen, conducted trading and plantation activities in Kamerun. With imperial treasury subsidies, the colony built two rail lines from the port city of Duala to bring agricultural products to market: the Northern line of 160-kilometre (99 mi) to the Manenguba mountains, and the 300-kilometre (190 mi) long mainline to Makak on the river Nyong. An extensive postal and telegraph system and a river navigation network with government ships connected the coast to the interior. The Kamerun protectorate was enlarged with Neukamerun (German: New Cameroon) in 1911 as part of the settlement of the Agadir Crisis, resolved by the Treaty of Fez. At the outbreak of World War I, French, Belgian and British troops invaded the German colony in 1914 and fully occupied it during the Kamerun campaign. The last German fort to surrender was the one at Mora in the north of the colony in 1916. Following Germany's defeat, the Treaty of Versailles divided the territory into two League of Nations mandates (Class B) under the administration of Great Britain and France. French Cameroun and part of British Cameroons reunified in 1961 as Cameroon. ^ By 1911 the total volume of trade reached over 50 million gold marks [Haupt, p. 64]. ^ This line was later extended to the current Cameroon capital of Yaoundé. DeLancey, Mark W.; DeLancey, Mark D. (2000). Historical Dictionary of the Republic of Cameroon (3rd ed.). Lanham, Maryland: The Scarecrow Press. ISBN 0-8108-3775-7. OCLC 43324271. Haupt, Werner (1984). Deutschlands Schutzgebiete in Übersee 1884–1918 [Germany’s Overseas Protectorates 1884–1918]. Friedberg: Podzun-Pallas Verlag. ISBN 3-7909-0204-7. Hoffmann, Florian (2007). Okkupation und Militärverwaltung in Kamerun. Etablierung und Institutionalisierung des kolonialen Gewaltmonopols. Göttingen: Cuvillier Verlag. ISBN 9783867274722. "German Cameroons 1914". UniMaps. 2004. Archived from the original on 4 April 2013. Map of the territories exchanged between France and Germany at the Treaty of Fez. Schaper, Ulrike (2012). Koloniale Verhandlungen. 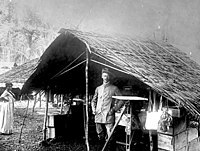 Gerichtsbarkeit, Verwaltung und Herrschaft in Kamerun 1884-1916. Frankfurt am Main 2012: Campus Verlag. ISBN 3-593-39639-4. Washausen, Helmut (1968). Hamburg und die Kolonialpolitik des Deutschen Reiches 1880 bis 1890 [Hamburg and Colonial Politics of the German Empire]. Hamburg: Hans Christians Verlag. OCLC 186017338.